I think that medals and awards need to be given out for some of the daily activities you do as a parent. It's like you're supposed to have a whole new skill set the moment your child enters the world. I imagine it to be like The Matrix, where they implant you with a chip so that you automatically know how to do things like how to get ridiculously orange poo stains out of every color of clothing or clip those tiny baby fingernails that are practically translucent. I thought, before I became a parent, that I knew most of what I would have to do each day. But no, it's the small things that leave me wondering "how the heck do I do this?" This last week my big dilemma has been how to get poo-filled onesies off of my child without covering him completely with poop. (I know, it's really important, earth-shattering, life-changing stuff here.) Each time I try, I either get poop all over myself or all over Nicholas. At least now I know why Oxi-Clean keeps selling, that stuff is miraculous! My favorite moment was when this happened in the waiting room at the pediatrician's office yesterday. While waiting to be called back to an exam room, Nicholas pooped. I didn't think much of it until Brian looked at me and said, "You have poop all over your hand." Awesome. I laid down my portable changing mat and put Nicholas on the floor while trying to simultaneously shield the rest of the patients from having to experience the pungent nature of this scene we were creating. Brian and I are both working on getting Nicholas's clothes off, and poop ends up on his arms, back, legs...everywhere. It was like a horror movie. As soon as we got the clothes off (but before we wiped him down) the nurse calls us back. Perfect timing. I hastily wiped him down with a baby wipe and carried my half-naked child back to the exam room. I would have appreciated a little ribbon or trophy after that episode. Instead I got a nice-smelling plastic bag to put his diaper in and raised eyebrows from other moms in the waiting room. Parenthood sure is glamarous, aint it? But then again, I get to see this face everyday. 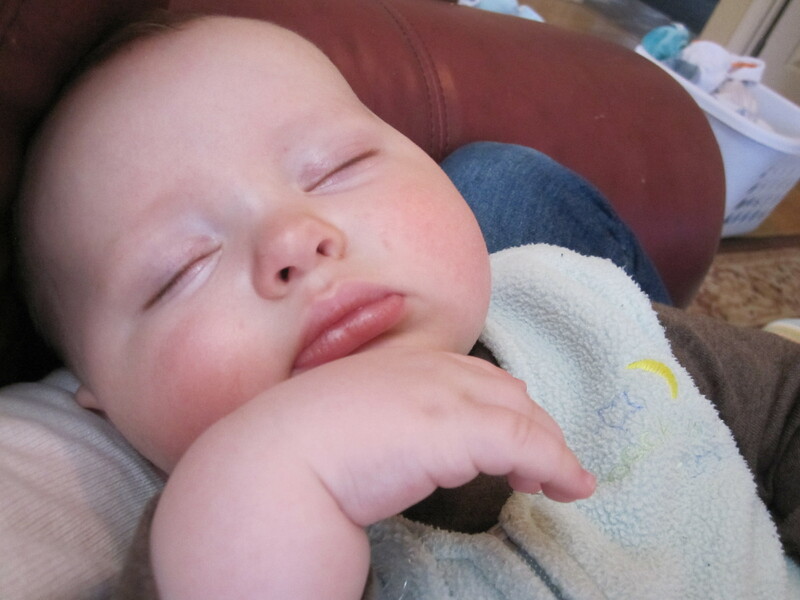 Yesterday he fitfully slept all day after his doctor's appointment. I can't resist cuddling him all day after he gets his shots. And yes, that is a pile of laundry in the background. It's been sitting in the same spot for 4 days. I would choose poop and wrinkled laundry any day if it means I get to be a mom! You should try clothe diapers! I never had poop explosions with my kids...unless they were in disposables! But then Again, I don't have a boy. I love your blog by the way! andrew had a blowout today on the ground in our living room. somehow, his clothes were completely spared, though... he pooped while his shirt was bunched up in the back, and the poop went straight up the back of the diaper. one trick i've found to getting poopy onesies off with making as little mess possible - roll them up as you take them off. then by the time you get to his upper back and chest and head area, the poop is usually rolled up inside the rolls of the onesie. Being a mama is the worst and greatest job there is! 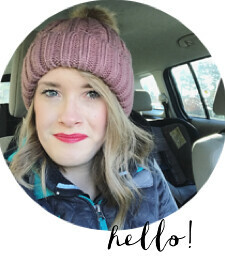 Found your blog through Aimee's hop and happy I did - I'll be following along now! Beth, I will definitely have to try the rolling technique. I'll let you know how it works :) Isn't it funny that this is something we talk about now? How to not get poop everywhere? Samantha, thank you for your kind works. Isn't being a mom awesome! And so gross sometimes? Have a Happy Easter as well! Amy, I have definitely considering going the clothe diaper route, that is just one more thing to put on the "pros" list. Thanks my friend! I hope you and Dusty are doing well! I love following your blog/facebook updates too! Thanks Car :) I'm glad it made you laugh. Love you friend!